Description from CTBikeRoutes: This 101-mile ride drops down to the shoreline in Old Saybrook by way of Deep River and Essex and passes through Otter Cove en route to the Baldwin Bridge bike path. After crossing to the east side of the Connecticut River via the bike path, the route heads east to the turnaround point at the former Seaside Regional Center generally following Route 156 (smooth with wide shoulders) with side trips into the Department of Environmental Protection’s Marine Headquarters, Rocky Neck State Park, Giants Neck and Black Point. On the return the route also follows Route 156 for several miles before taking an inland route to the suggested lunch/snack stop at Hains Park at the south end of Rogers Lake on Route 1 in Old Lyme. 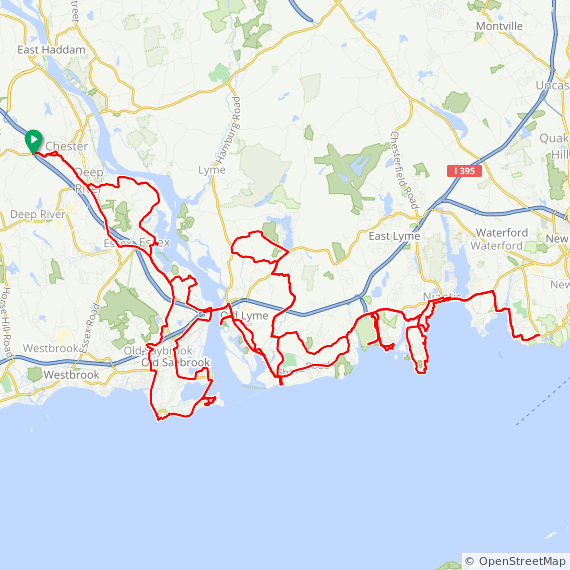 Continuing, the ride takes a circuitous route back to the Baldwin Bridge and once on the west side of the Connecticut River, it heads into Old Saybrook en route to Saybrook Point, a tour of Fenwick, and a quick look-in at Cornfield Point before returning quite directly to the CPL.